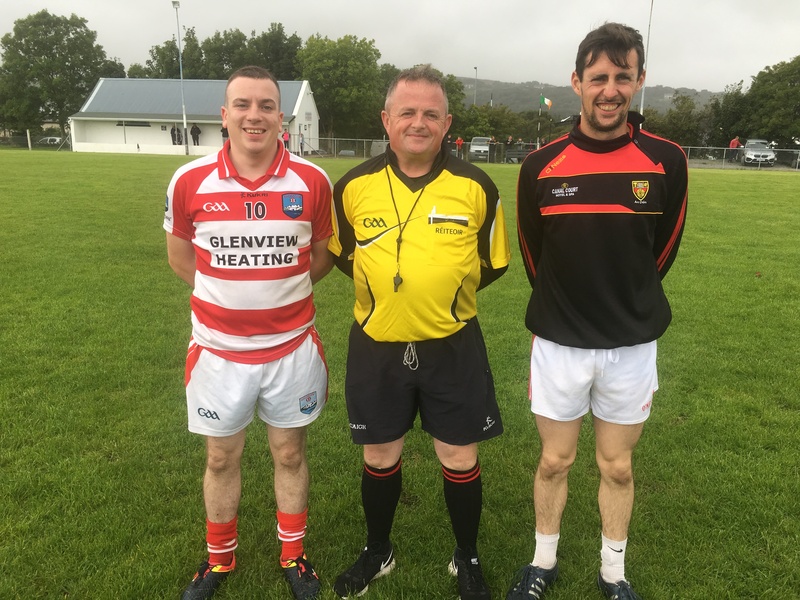 Urhan booked their place their place in the Beara junior B final with Castletownbere, following a hard earned win over Adrigole in their semi final replay, played in blustery and sometimes rainy conditions in Castletownbere last Sunday. Having the wind at their backs in the first half Urhan kicked over the first 5 scores within 12 minutes with 2 points from Martin O’ Neill, 1 from Brian Healy and 2 pointed frees from Sean O’ Sullivan. It was 13 minutes into the game before Adrigole raised the white flag when experienced corner forward Fergus Carey got their first score and his Droumlave neighbour Kenneth O’ Neill kicked over a fine score in the 15th minute to leave 3 points between the sides. Urhan replied with points from Sean O’ Sullivan and Martin O’ Neill to extend the Urhan lead back to 5. A free from Eamonn Jer O’ Sullivan and further points from Jamie O’ Sullivan and Eoin O’ Sullivan reduced the lead to 2 points after 25 minutes, but Urhan quickly replied with points from a free from Sean O’ Sullivan and another from Michael Shea to leave Urhan leading 0-9 to 0-5 at half time. Despite playing into the wind in the 2nd half it was Urhan that made the brighter start to the 2nd half with points from Turlough Connolly and 2 from Sean O’ Sullivan, giving Urhan a 7 point lead after 37 minutes. With the inclement weather making life difficult for both teams, the 7 point lead proved invaluable to Urhan, but Adrigole continued to press forward. A point from Mike Phil O’ Sullivan and an excellent long range curling point from Jason Goggin reduced the lead to 5 points after 40 minutes. This would be the last time would raise the white flag in the game. Urhan would score the next 4 points with Martin O’ Neill (2), Ryan Quirke, and Turlough Connolly all adding to Urhan’s total. Deep into injury time, a Eamon Jer O’ Sullivan 45’ sailed all the way into the Urhan net, but this was to be the last score of the game with Urhan emerging winners 0-16 to 1-7. Urhan. Ger Dunne, Joseph O’ Sullivan, Niall Dwyer, David Cronin, Ryan Quirke, Kieran O’ Sullivan, Joseph Sheehan, Brian Healy, Michael Shea, Sean O’ Dwyer, John Paul Sheehan, Kevin Hartnett, Martin O’ Neill, Turlough Connolly, Sean O’ Sullivan (Captain). Adrigole. Aidan Cremin, Sean Green O’ Sullivan, Sean Joe O’ Sullivan, Dan Crowley, Jason Goggin, Pat O’ Sullivan, Stephen O’ Sullivan, Darragh Carey, Mike Joe O’ Sullivan, Eoin O’ Sullivan (Captain), Eamon Jer O’ Sullivan, Jamie O’ Sullivan, Mike Phil O’ Sullivan, Kenneth O’ Neill, Fergus Carey. Subs. Timmy Phil O’ Sullivan for Darragh Carey (47 min inj) Timmy Lynch for Eoin O’ Sullivan (55 min) Timmy Glen O’ Sullivan for Kenneth O’ Neill (56 min). James O’ Grady for Fergus Carey (59 min inj).